Published on 28 January 2012. 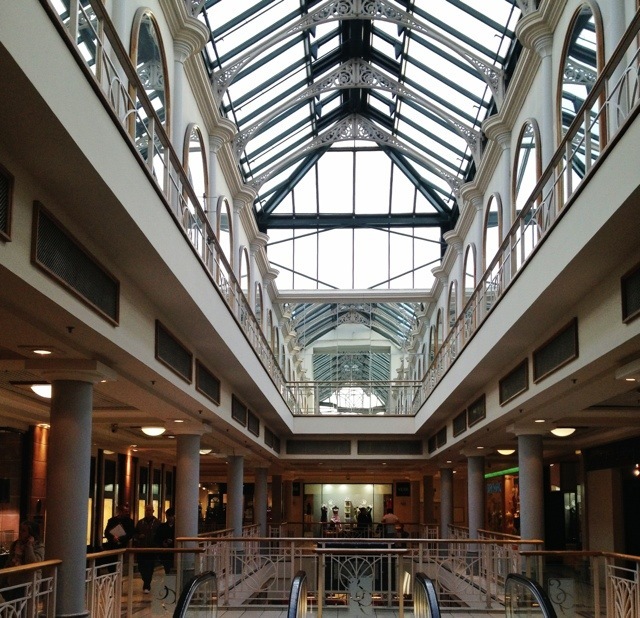 This is the fairly impressive roof of Eldon Garden, which is marred by the 80s decor which consists mainly of arched mirrors, presumably to try and make the space look lighter. Given the arty reputation Eldon Garden tries to create for itself, I reckon it would look great with a bit of a renovation and a hanging artwork – something like a mini version of Snow’s Flight Stop in Toronto – but something more local to Newcastle, of course, and perhaps more in keeping with the wrought iron supports. This 1,501st post was filed under: Photo-a-day 2012, Architecture, Newcastle-upon-Tyne, Retail. Trackback received at 15:25 on 12th February 2012.